The quest to find further high-temperature superconductors continues apace. In a recent Letter in Journal of Physics: Condensed Matter, Zhi-Cheng Wang and Guang-Han Cao report on the first 12442-type oxyarsenide superconductor, RbGd2Fe4As4O2. 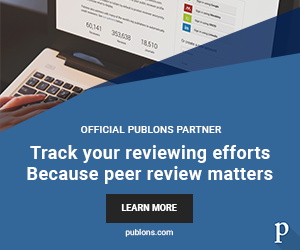 Below, the authors talk in more detail about their exciting findings. To date, iron-based and cuprate superconductors are the only two classes of materials that exhibit high-temperature superconductivity (HTSC) under ambient pressure. Both classes of materials are two-dimensional in crystal structure, in which the CuO2 planes and Fe2X2 (X refers to pnictogen or a chalcogen element) layers serve as the crucial ingredient for HTSC. In other words, the crystal structures of iron-based (cuprate) superconductors are nothing but the stacking of Fe2X2 (CuO2) sheets with other spacer layers alternately along the crystallographic c axis. This structural feature makes it possible to explore new superconductors via a rational structural design. Temperature dependence of resistivity for the RbGd2Fe4As4O2 polycrystalline sample. The inset magnifies the superconducting transition, in which the onset, midpoint, and zero-resistance temperatures are defined. Shown on the right side is the crystal structure projected along the [1 0 0] direction. We note that, while many cuprate superconductors possess separate multi-CuO2 planes, it is not the case for Fe-based superconductors (FeSCs). FeSCs contain either separate Fe2X2 monolayers, as the case for LaFeAs(O,F); or infinite Fe2As2 layers, akin to (Ba,K)Fe2As2. Following our structural design approach [H. Jiang et al., Chin. Phys. 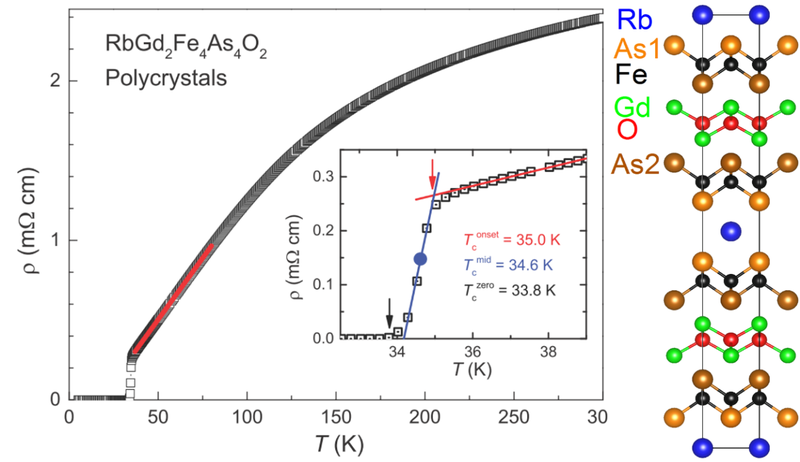 B 22, 087410 (2013)], however, we recently succeeded in synthesizing a “12442”-type iron fluo-arsenide KCa2Fe4As4F2, which is the first FeSC that contains separate double Fe2As2 layers [Z. C. Wang et al., J. Am. Chem. Soc. 138, 7856 (2016)]. In this Letter [Z. C. Wang et al., JPCM 29, 11LT01 (2017)], we have made further progress: we discovered the first 12442-type oxyarsenide superconductor, RbGd2Fe4As4O2. With the formal valence state of Rb1+Gd3+ 2Fe2+ 4As3- 4O2- 2, there remains one less positive charge in a formula unit, which reflects a hole doping of 25% in the stoichiometric compound. Moreover, the Tc value of 35 K represents a new record for hole-doped oxyarsenide FeSCs, and the initial slope of the upper critical field is exceptionally high among all the known FeSCs. The successes in discovering 12442-type FeSCs provide inspiration for future structural design work. In practice, we have found that lattice match between the related structural blocks are important for the synthesis of 12442 phases. The explorations are still going on, which are expected to further expand the family of 12442-type FeSCs. Zhi-Cheng Wang is currently a PhD student at the Department of Physics, Zhejiang University. His PhD research focuses on the explorations and physical property measurements of novel superconductors. Guang-Han Cao is a Qiushi Professor at the Department of Physics, Zhejiang University. He received his PhD degree from University of Science and Technology of China in 1995, and then became a postdoctoral fellow in Zhejiang University where he has stayed until present. He visited the National Institute for Materials Sciences, Japan, from 1999 to 2001, and he also worked as a visiting Professor at the Institute of Solid State Physics of the University of Tokyo in 2011. His research interests include exploratory synthesis, structural characterizations and physical-property measurements of novel superconductors and other related materials. Figure from: Zhi-Cheng Wang et al 2017 J. Phys. : Condens. Matter 29 11LT01. Copyright IOP Publishing.